I love spicy food and try to eat it as much as I can. There’s something about the flavor and the feeling that comes with it that I can rarely get enough of. I know spicy food can be too much for some people. But for those who can handle it (or for those who are able to work their way up), there are some pretty substantial health benefits. Spicy food is linked to weight loss and limiting inflammation, but the most interesting fact about spicy food I’ve recently come across is that a new study has shown spicy food can reduce your risk of colorectal cancer! The active ingredient that gives chili peppers their spiciness is a compound called capsaicin. Capsaicin is what is responsible for most of the health benefits associated with spicy foods, and it is also the catalyst for this new development in the fight against cancer. Capsaicin activates a receptor in the intestinal lining, of mice, in this case, triggering a reaction that leads to a reduced risk of colorectal cancer. Researchers believe it would have the same effect on humans. There is a receptor in your intestines called TRPV1 that’s activated by something called the epidermal growth factor receptor, or EGFR. The EGFR is a catalyst for normal cell production and turnover in the gut, usually turning over every four to six days. TRPV1 helps control the EGFR, which is important, because if the EGFR is not restrained, it can overproduce cells that can be cancerous, leading to tumors. Without regulation by TRPV1, the chance for sporadic tumor development greatly increases. TRPV1 activation is stimulated by capsaicin, which is how spicy foods can help keep your colon cancer-free by working as a tumor suppressor. To date, cellular research on human colorectal cancer samples indicates mutations to the TRPV1 gene, which could be responsible for an inability to regulate the EGFR. More research is still needed to confirm if TRPV1 deficiencies are a direct risk factor for colorectal cancer. So try adding a little spice to your food when possible. 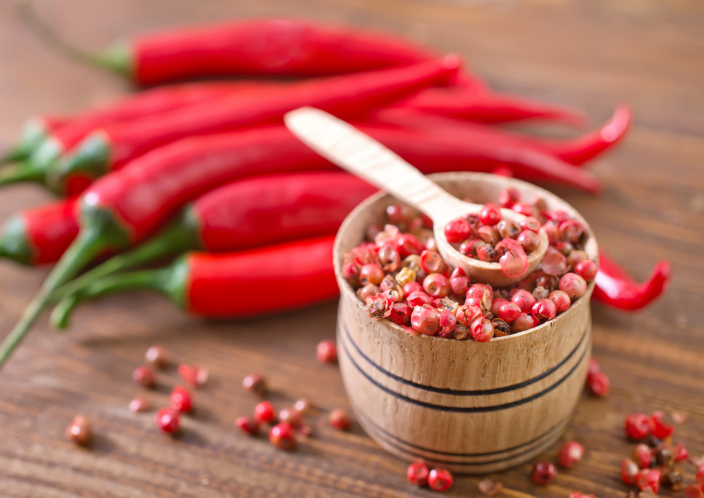 You don’t need to add a lot, but including a bit of chili pepper could be a healthy way to add some flavor and lower cancer risk. If you can’t do spice at all, try working your way up starting with your regular black pepper or fresh-ground peppercorns. They won’t have the same effect on your health, but they will help you get to a point at which you can stand more heat. University of California, San Diego, “Study: Spicy Capsaicin Can Reduce Risk of Colorectal Tumors,” News-Medical web site, August 3, 2014; http://www.news-medical.net/news/20140803/Study-Spicy-capsaicin-can-reduce-risk-of-colorectal-tumors.aspx.